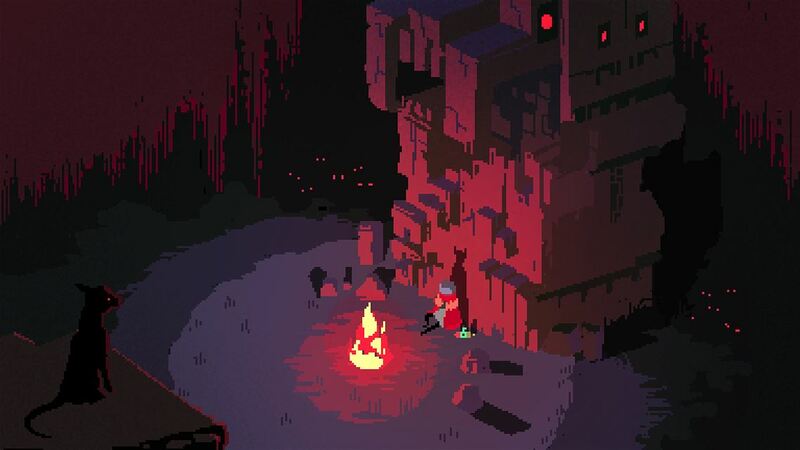 Playing Hyper Light Drifter is akin to stepping into a time machine and playing some of the classic adventure games on the Nintendo Entertainment System and Super Nintendo. Back to a time when adventure games truly were adventures, without handholding or coddling. Sporting beautiful pixelated graphics and a world with countless nooks to explore, Hyper Light Drifter is definitely easy on the eyes. Old style games are typically polarizing to today’s gamer, some relish the challenge and call-back to the old days while many are immediately put off by art style alone. As a product of the 8-bit gaming era I wasn’t sure how I’d fare, I found myself pleasantly surprised. 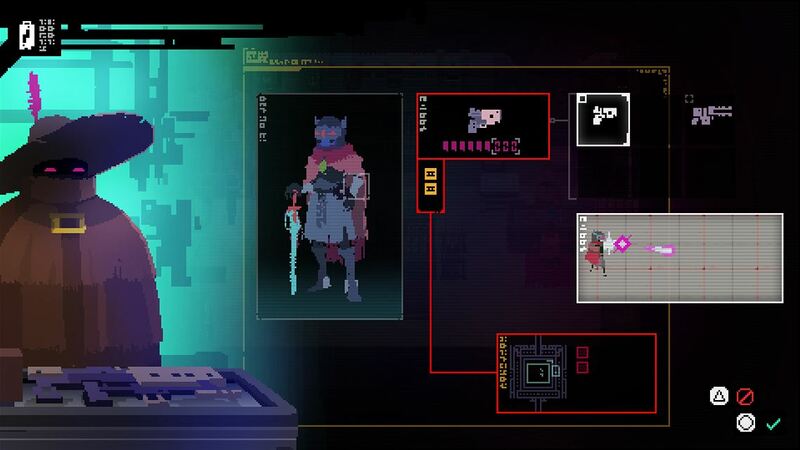 The story in Hyper Light Drifter is open to interpretation due to the lack of any dialog or voice acting. Story segments are shown through either cutscene or storyboard-like sequences that let you judge what is happening in the world. In the beginning of the game I just was stumbling into progress, exploring any direction I wanted. Along the way I met some quirky townsfolk, slashed or shot baddies and discovered hidden secrets. As you progress you will be pointed in the direction of a “dungeon” on your map, most with formidable enemies and bosses. Your character can upgrade his agility or combat skills with special currency, but the game can be played without these upgrades if you are skilled enough. 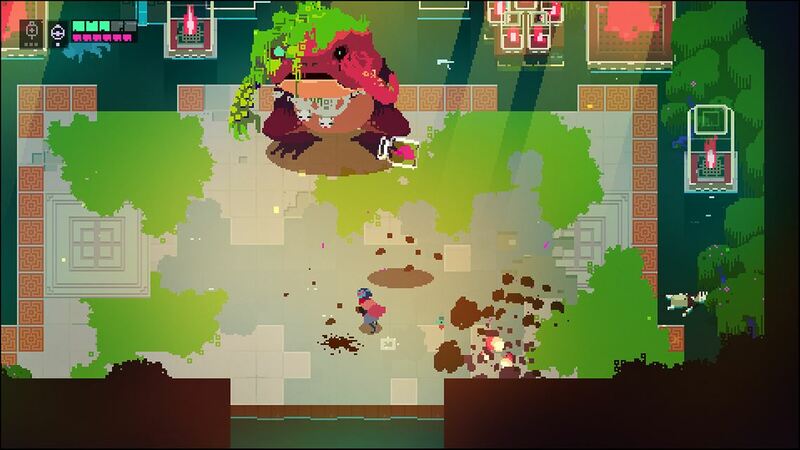 Combat in Hyper Light Drifter is simple and smooth, but not necessarily easy to master. You character wields a sword and has a gun for long range attacks, in addition to some nifty evasive rolls. Fighting common enemies isn’t always routine with their jerky movements and attack patterns. While I looked the part of a badass with my weapons and flashy moves, I always felt vulnerable. The enemy interactions kept me feeling tense and paying attention not just in dungeons but the overworld as well. I liked how enemies presented a challenge and weren’t just roadblocks to slow me down. 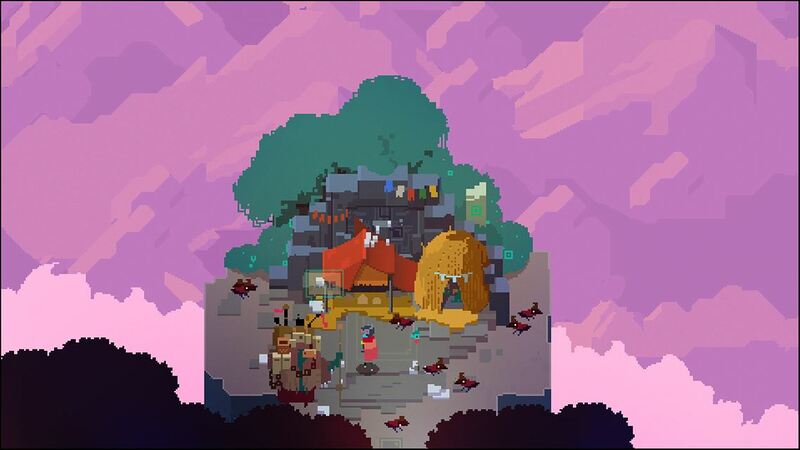 You only need to watch one trailer for Hyper Light Drifter to understand that it’s a gorgeous game. The use of colors is just as incredible as the attention to detail. I actually had to look up how to take screenshots (I don’t have Kinect installed) because there were so many beautiful moments I felt compelled to share on my Xbox feed. In any given screen there can be so much going on, from animals frolicking about to weather changes like wind and snow. It may very well be the best looking “retro” style game I’ve ever seen. Hyper Light Drifter is an amazing experience that takes me back to the gaming days of my youth. The combat is easy to learn and hard to master, the graphics speak for themselves and a new game plus mode means the party doesn’t stop when the credits roll. I have no doubts that it will be on many indie game of the year lists and maybe even nominated alongside AAA games in other categories. That being said I still don’t think it’s a game that everybody will enjoy. Gamers who like linear experiences and games that guide you for every mission will likely not enjoy Hyper Light Drifter. 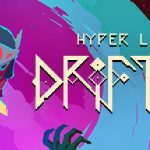 Fans of old school adventure games, Metroid-vanias, and especially Zelda might find Hyper Light Drifter to be their game of the year.